“Hundreds of additional U.S. diplomats and civilian officials would be deployed to Afghanistan as part of the new civil-military regional strategy that President Obama’s top national security advisers plan to present for his signature next week, according to administration officials. Leading this proposed civilian expansion will be two veteran senior diplomats: Peter W. Galbraith, who will be the deputy to the top United Nations official on the ground; and Francis J. Ricciardone Jr., who will get the unprecedented title of “deputy ambassador” to boost the diplomatic heft of the U.S. Embassy. Obama last week nominated Lt. Gen. Karl Eikenberry, the former U.S. military commander in Afghanistan, as the country’s ambassador. The unprecedented title of “deputy ambassador” — hmnn, I wonder — is that the Deputy Chief of Mission position under a nicer name? Or does that mean, Ambassador Ricciardone is the embassy’s #2 and some other hombre is going to be DCM/#3? 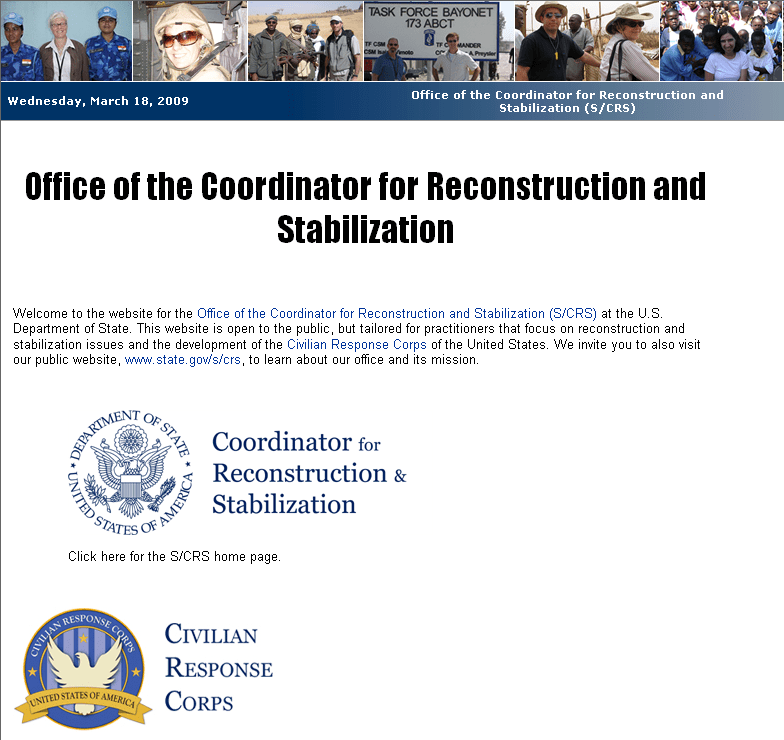 The quiet re-launched in the last few days of the new spruced up website of the Office of the Coordinator for Reconstruction and Stabilization must not be an accident. See below. As far as I can tell the listed vacancies have not changed so I am presuming that the solicited applications mentioned in the report above were from internal applicants. As to the “hundreds of additional diplomats” I have no idea if those will be new hires or “go there” directed assignments; we’ll have to wait until next week when the President signs off on this. A Diplomatic Surge? What’s the Campaign Plan? Okay, so no official word on how many FSOs (if you’ve heard anything from the grapevine, please share) are going. But I’m wondering what these 51 folks would be doing exactly in Afghanistan? And where would you find 51 reconstruction/stabilization specialists who would want to sign up for a job and be kicked out after a year — Michigan, Rhode Island and California? Tempest on the Hill Over Christopher Hill’s Nomination? He is the first career Foreign Service Officer nominated by the Obama Administration to get his embassy and Congress is unhappy enough to ask the President to withdraw his nomination. Go figure! See the senators’ letter here. Briefly, some senators want the President to withdraw his nomination of Christopher Hill as Ambassador to Baghdad because – well, because …. Apparently — because 1) of his long record of service outside the Middle East and outside the sphere of civil-military relations; 2) he may need the equivalent of a crash course in Iraqi Affairs; 3) they found his work in the Six Party Talks for North Korea “deeply troubling,” and 4) he talked – he talked to NYT’s David Sanger for his book The Inheritance, where he is quoted as referring to his superiors in “dismissive and derogatory” terms! Well, first — Ambassador Hill in the Sanger book (see my previous post Our Inheritance: Bush’s True Legacy) did call a bunch of them “assholes,” with total frankness; it was refreshing to see that in black and white. He also said honestly that these folks “did not know how to negotiate,” (he could have pretended that everyone knew what they were doing, he did not). And of course, he did slog through the Six Party Talks despite the bureaucratic minefields and live to tell about it – I think I’ll mark that last one down for professionalism. Frankness, honesty and professionalism — okay, done! But that thingy about a “crash course” really gets me though — how come we don’t hear from these guys when car dealers and board sitters are nominated as ambassador to some enchanted country and needed crash courses in diplomacy and world affairs? Last Monday, Secretary Clinton was asked specifically about the Hill nomination and she had a lot to say. QUESTION: Madame Secretary, how do you respond to criticism from Senators McCain and Graham and Brownback that Chris Hill is – does not have the experience necessary to become ambassador in Baghdad? He doesn’t have the experience in the Arab countries. And they also allege that he doesn’t have the negotiating skills necessary, and they point to the recent deadlock in the negotiations with North Korea as an example. SECRETARY CLINTON: Well, obviously, I think both of those criticisms are unjustified and unfounded. Chris Hill is a distinguished, experienced diplomat who has served in some very difficult positions on behalf of our country. Another very distinguished, experienced diplomat, John Negroponte, was our ambassador to Iraq. He did not have Middle East or Arabic language skills when he was sent to Iraq. I believe the people you’ve just mentioned, my former colleagues, all voted for former Deputy Secretary Negroponte. So I think on the experience basis, he is not only very well-qualified in terms of running a large embassy, helping to deal with the myriad of issues that will arise as we conduct our withdrawal, but we’ll have around him, as any ambassador does, people who have particular skills and expertise. With respect to the North Korean mission that we believe Ambassador Hill carried out with great persistence and success despite some difficult challenges, this is a hard set of challenges to meet. And it is our perspective that he made a lot of lemonade out of some pretty bad lemons, and he was able to get the North Koreans on record as agreeing to certain obligations. We now have to follow through on those obligations. So our assessment, which we believe is rooted in the facts, may be different from those who, you know, are rightfully distressed with and extremely critical of North Korean actions on human rights, on their continuing effort to obtain nuclear weapons, on their belligerence and their provocative actions. But that is something that is not in any way reflective of the job that Chris Hill did in the Six-Party Talks, where we think he did a very good job. Well, I’m glad she said all that. For the record, GOP senators McCain, Graham, Brownback and all the signatories of this letter, voted to confirm Negroponte as Ambassador to Iraq on May 6, 2004. Ambassador Negroponte was overwhelmingly confirmed in a vote of 95 to 3. The three who voted against his confirmation? All Dems — Dayton (D-MN), Durbin (D-IL), and Harkin (D-IA). Reports indicate that Senator Brownback is expected to mount the stiffest opposition to the Hill nomination because of a long-running dispute over how to handle human rights abuses by the North Koreans. But the good senator did vote “Yea” for Ambassador Negroponte who has a weighty human rights baggage (allegations denied by the ambassador) from his tour as US Ambassador to Honduras. It was all right for Ambassador Negroponte to serve in Iraq even when he previously served only in Europe, Central America and Asia and spoke no Arabic, but it is not all right for Ambassador Hill to serve in Iraq because he previously served only in Europe and Asia and speaks no Arabic? Wow! I am utterly confused now but — I’m glad to see this statement of support for Ambassador Hill from Senator Lugar. I do wonder still what kind of fish sauce are they eating over there? Curious minds would like to know ‘cuz it stinks. PHK corrected me on Negroponte’s record: he was Consul General in Thessaloniki, Greece in the 1970s so he did serve in at least one European country as well as Latin America and Asia. Thanks PHK! Read up on John Negroponte here, and Christopher Hill here. 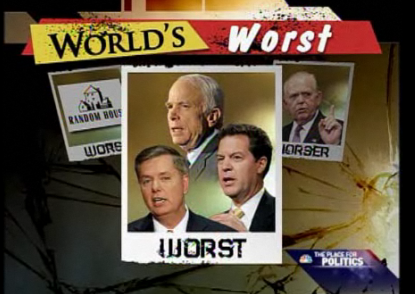 Short-term memory senators have now made it to Olberman’s Worst Person segment today. Starts at 00.46 into the short clip. Huh? News: U.S.-born Children in State Foster Care Sent Overseas? Reporters for The Oregonian have apparently filed records requests and interviewed state officials about the case since August. On Tuesday, as their series was being prepared for publication, Oregon’s Department of Human Services announced a moratorium on sending foster children out of the country. State officials say they want to develop international agreements before more children are sent abroad. Huh? Ought this not be the other way around? The Oregonian reports that the State of Oregon has sent 13 children to Mexico for adoption since 1999; state officials expect the number to grow. Five children were in the pipeline for Mexico when the moratorium took effect. Since 1999! 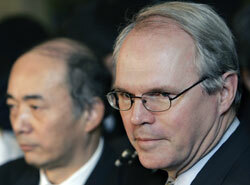 Ten years ago – and just chatting about international agreements now? I wonder if any U.S. state notifies the federal government when they do this? These American kids — they just fall through the cracks? A shameful shade of gray and no one’s at fault?